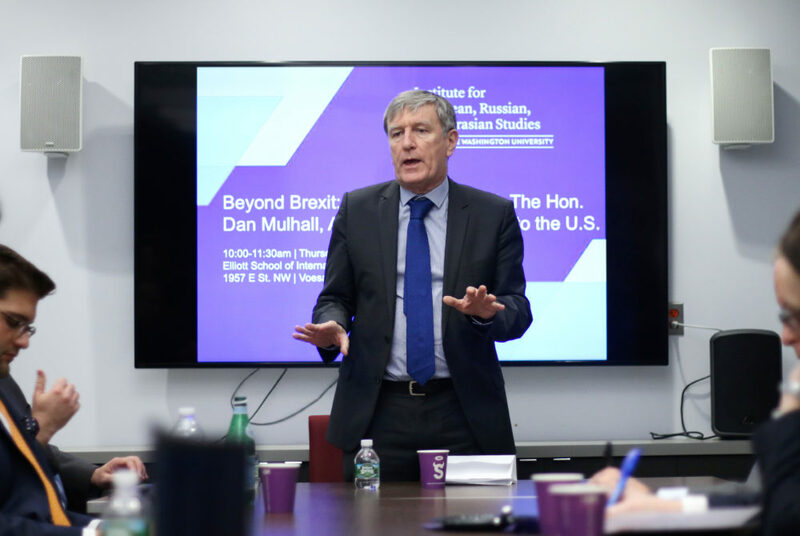 Daniel Mulhall, the Irish ambassador to the United States, spoke at the Elliott School of International Affairs Thursday about Ireland's stance as the United Kingdom grapples with Brexit. The Irish ambassador to the United States spoke at the Elliott School of International Affairs Thursday about the relationship between Ireland and the United Kingdom after Brexit. Daniel Mulhall, who has served as the Irish ambassador for about a year and a half, discussed the potential effects of Brexit, the United Kingdom’s decision to leave the European Union in 2016. At the event, hosted by the Institute for European, Russian and Eurasian Studies, Mulhall said his country fears that Brexit could harm Irish economic interests in the United Kingdom. British and European officials have engaged in negotiations for three years since the vote, but the British Parliament’s rejection of several Brexit deals culminated earlier this month with European officials allowing the United Kingdom a two-month extension before the country must leave the European Union. The state of the border between Northern Ireland, a constituent nation in the United Kingdom, and the Republic of Ireland has also presented itself as a point of contention in Brexit negotiations. The Good Friday Agreement, which ended years of conflict between Northern Irish citizens who wanted to remain part of the United Kingdom and unionists who wanted to join Ireland, stipulates that no visible border should be erected between the two countries – a promise the U.K. leaders cannot keep if they want to regulate the flow of migrants after exiting the European Union. Mulhall said any “hardening” of the border between the United Kingdom and Ireland could result in “additional tension” among Northern Irish unionists who want the United Kingdom to relinquish its hold on the nation. “For Northern Ireland nationalists – these are people who have an Irish identity and would ultimately like it to become part for a united Ireland – they would see a border installation as a loss for them,” Mulhall said. In recognition of the conflict, Prime Minister Theresa May proposed a Brexit deal last year that would leave the Northern Irish border as is on the condition that the U.K. remains in the European Single Market, which aims to grant free movement of goods within the EU. For hardline proponents of Brexit in the British government, the agreement is an unacceptable compromise. Though Brexit may complicate Ireland’s economic relationship with the United Kingdom, Mulhall said his country intends to “maximize the upsides” of the situation by pursuing American businesses that might have otherwise sought to do business in the United Kingdom. Mulhall said his country is committed to remaining in the European Union and is looking forward to exerting a more powerful and positive influence on the international community.